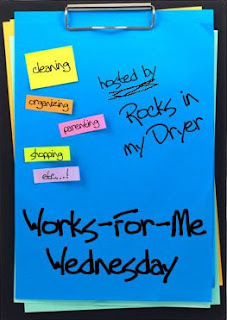 A Life At Home: Works for me Wednesday: Ideas for making it work on one income? Works for me Wednesday: Ideas for making it work on one income? This weeks WFMW is to rerun your greatest tip. Since I haven't been doing this long I thought I'd just go back to my first one. Making ends meet on just one income can be tough. I got alot of great responses the first time so i'm hoping to get even more creative ideas. It's so much easier when we all help eachother out. If this is an area you worry about yourself, look through the comments and see if there's anything you can try. Thanks so much! This is my first time posting at Works for me Wednesday, but it sounds like alot of fun. It's also a backwards edition, where you ask questions to the readers. So, here we go! My question for all of you is, can you give any tips for making it work on one income in a two income society? I am always looking for different things to do here that can make my life, as a stay-at-home-mom easier. It can also be discouraging to ladies who may be wanting to come home, but don't see how in the world they can make it work. So any tips on saving money, making money from home, making our dollar stretch, etc...would be greatly appreciated. Any encouragement you can give women who are wanting to come home, but are afraid to, would be great too. Also, any input on why you think it is important to stay home is also welcome. Thanks so much! Sometimes it can be a trick to live on one income, instead of two. It is definitely not easy with how prices are going up and up, but it can be done. I stay at home and have a 15 yr. old, 3 yr. old, and a 6 mo. old. Couple of things that work for us is: 1) we do not have cable/satellite. We just watch the 5 channels that our TV picks up (it's abc, cbs, fox, pbs, etc). This saves some money. 2) Something I've just started doing is planning a weekly menu. This helps me to know what I need at the store and it prevents me from buying unnecessary items. 3) having a budget and sticking to it is a big help. I hope some of these suggestions are helpful. Best of luck!! Good question! I offer all types of money saving tips and ideas on my blog. I think some of the ways moms can make extra money are to sell things on ebay and take online surveys. I have a list of survey sites on my blog. You're right- it's hard to figure out how to make it work on one income when it seems like most families barely survive on two. Some things are obvious-for example, we don't pay for cable, called I.D., etc. and we rarely eat out. I don't buy much make up and we do only a few extracurriculars. Until recently we only had one car and it worked well. I just did errands after my husband was home or we took him to work and picked him up. We lived in a small town so it worked well. We avoid the mall because there isn't anything there we really need anyway. We find great sales for things like clothes. It's true that nearly every penny is budgeted, but it is important to me to stay home so I am willing to do almost anything to make it happen. There are tons of great websites and blogs for ideas. Good luck! We're a one-income family, as well, and it's not easy! We've recently switched to cloth diapers to cut costs. We limit our driving, trying to accomplish errands all in one day, rather than several days. I also (try to) plan a weekly menu to help with grocery savings. It's hard but it can be done. Like some of your other comments, we don't have cable (our basic runs $11.15/mo), we drive older cars with no payments, we pay cash for things and if we don't have the money, we don't buy. Weekly menu planning helps with the mindless spending which happens at the grocery store. We keep Birthdays simple (a cake and one present for the birthday child) and Christmas is very simple. We consign the clothes our kids outgrow and with the money, we buy consigned items for the next season. It is usually a wash with the exception of shoes. We make all our meals from scratch and don't go out to eat. We find free things to do with the kids (picnics, nature walks, park, playgrounds, library story times, even lunch in the van watching airplanes take off and land at the airport). Oh, I could go on and on. :) Budgeting VERY carefully and sticking to it is the best place to start. Good luck. We do whatever it takes for me to stay home. My husband works and then he picks up other jobs at night/weekend in his field that pay a lump sum at once. No cable/sat. tv, one cell phone-only for work, only drive w/in a certain radius to run errands (everything is within 2 miles), no eating out/ordering in, use library for movies, make a menu for week, shop at the bread outlet and local ethnic stores for groceries where the prices are cheaper and better quality for food (I also shop at other stores too), pack lunches/snacks/drinks where ever we go, do not go to the mall or any other place where the "want monster" will show up and then the biggest help is have a don't spend anything week-it includes groceries, just make due with what we have. Which we found out is not such a big deal, but it makes you think twice about-oh I'll just to pick up this or that. Sell stuff we don't need and the list can go on and on...... Like I said, whatever it takes. It is getting harder since the prices here in the Ft. Lauderdale/Miami area have gone up so much. But we just keep pluggin away. Take advantage of all the free things going on in your community! Libraries, book stores, and local parks are treasure troves for this stuff. Check out local newspapers and those free parent magazines they give away at libraries for listings. Also many city museums have free days! Rent movies from the library or from Redbox which constantly has free codes online. Entertainment is one area that can add up quick if you're not careful! Hi! I saw your link on our local forum and had to stop by. It is so nice to see other mothers who have similar beliefs as me. BTW, Hillbilly Housewife is one of my favorite sites also. 1. We make a list of what we need from the grocery store, and that is ALL that we buy while there (I shop at Wal-Mart, so I tend to get off track:)) Also, we buy store brand items if possible. When something goes on sale that I know we use, I buy a lot of it. I've also tried coupouns, but didn't work well for me. 2. We go to Costco and buy in bulk, we have a family of 5, so this helps. We went about 5 months ago, and loaded up on the basics, cleaning supplies, toilet paper, napkins, ketchup, etc. And we spent about 200, but we haven't needed any of those items yet. So that leaves us weekly, only shopping for food items. Also I started selling Avon, which was only $10.00 for me to get started, and I love it, I can make extra money, but also stay at home and I put as much, or as little into it as I want too. If you would like more info on this, let me know! 7) Buy whole foods instead of processed foods - you get more, pay less, and don't pay tax, plus they're usually healthier, even if you don't buy organic/all natural. 8) Try store brands - some are just as good, if not better, than name brands, and usually cost less. 10) If you have consumer debt, consolidate any debts into one loan (only if it is lower interest than the average you are paying for all other items, and only if you get rid of the cards/loans involved). Those are just a few of the things that have worked for us - I've blogged about others in my "Save Money" category on my blog as well. Good luck! I love ALDI for grocery shopping, if you have one near you. I probably save $150-200 a month from what I was spending at the local grocery. You do have to take your own bags and bag your own stuff, but I think it's worth it! We lived on my teaching income while my husband was in grad school and now on his income while I'm a SAHM. A book that helped us SO MUCH is the Tightwad Gazette by Amy Dacyzyn. You could probably pick it up at your library. Dave Ramsey's Financial Peace University and related books-Financial Peace, More Than Enough, and Total Money Makeover were huge for us as well. I am still learning this b/c I am still working part time with hopes of being home full time sometime in the future. I am learning to live frugally now. 3. You can also go to cloth napkins instead of paper towels. 4. although I have not done this yet(but very much contemplating it) Getting a Diva or Keeper cup to use for periods or what is called mama cloth. Once you buy it save money each month. 5. Like others have said before, we have only basic cable, only one car until we can hopefully buy one cash. I am still learning how to cut down on the grocery bill and cut out eating out as much. It can be hard to make it in today's world on one income. We have done it for 15 years, there have been ups and downs, but we finally seem to have the hang of it! (slow learners, I guess) Anyway, I have a blog that focuses on frugal living, you are welcome to check it out. We are a family of 8. 3. Buy clothes at thrift stores and yard sales. 7. Don't eat out, save it for special occasions. 9. Bake from scratch. It is cheaper and healthier. Hope that helps, it looks like you are getting some great ideas. Make friends with someone with kids who can swap babysitting with you...You watch hers, she watches yours. Frees you up from the distraction at the grocery store, other errands, helps out on date night, etc. Go out to eat ONCE a week, strictly, or less often, including fast food. Be prapared (when you can) and pack lunches for those days you have 17 errands that take all day. Plan your errands ahead of time to save on gas. Activities for kids that are free...Library, playgrounds, etc. Get down to the basics on things like phone, cable. Some can even elminate those things altogether. angelfoodministries.com is an inexpensive way to buy food. They have host sites all over the place. We've used it many times, and has helped out in a pinch too. Eat more vegetarian meals, and less cheese. Beans, rice, lentils, etc. are much less expensive! One thing that might help you put yourself in the one-income mindset is to think about what it actually costs one of you to go out to work! Really, by the time you factor in transportation, clothing and lunch--not to mention what's taken out in taxes anyway--then you really aren't bringing that much home with a second income! I second, third and fourth a lot of the advice here. Menu planning is a great way to save money! You might also want to look into "The Grocery Game," which helps you combine sales with coupons at the local grocery in order to build a good stockpile of food, household supplies and personal items. I've been doing it for about 3 years now, and I save an average of 40% on my groceries each week. In fact, I have such a good stockpile that my list is pretty short these days. I would check out www.moneysaving mom.com her website helped me a lot in living on just one income. Best of luck to you, being at home is a very noble and rewarding thing to do. One of the things I do is to use rags as much as possible instead of paper towels. I have a skinny cabinet in my kitchen that, for me, isn't good for storing anything else, so rags are kept here...socks, t-shirts, etc., that have holes or rips too big to be mended. I had some cloth napkins that we've been using for years, and when these got raggedy I started looking for something to replace them. This may make some of you squeamish, but I started eyeing all of those sock rags (that have been washed hundreds of times, BTW!). I cut the "toes" off and cut it up the side to make a "cloth napkin." I think one of the things you will find is some creativity in looking for solutions right under your nose. :) Especially if you read books like Amy Dacyzyn's book, as recommended in another post. Best wishes to you and your family! One thing that has really helped us in our quest for financial freedom is committing to saving half of all raises my husband gets. When he switched careers and I stopped working we had to use the entire first raise just to make ends meet, but after that we've immediately diverted half of all raises straight into savings. After three years of this, we've been able to stay debt free, slowly raise our standard of living, and save quite a bit for future plans--money that could have easily been absorbed into the budget if we weren't very careful about saving. When I was a full-time SAHM, I babysat to make extra money. My cheques were always for the extras like going out for dinner, clothes, etc. When my husband and I were getting premarital counselling, our pastor told us we should use my husband's paycheque for all the neccessities and if I did work, to use it for the extras. That's always worked for us! Now that my kids are older and I do work part-time, we still always have one of at home. My husband is fortunate enough to be able to work at home or shuffle his schedule around mine. The benefit is the kids get some time with just Dad, which they love because they can make him play with him as long as they want! Make your own restaurant recipes at home! Calling for help on a blog design! Win a Free Rosetta Stone Program! Kids choice week, $60 spent on this menu!! Quick tip on how to get free produce! Free Cereal Week for Me!